"The Gulf War Chronicles" has qualified for my publisher's most prestigious level of achievement - the STAR program. In this program, iUniverse is going to professionally edit the book and re-release it in a format that should enable it to be on the bookshelves of your local bookstore. They have agreed to let me include a photo plate in the center of the book. If you have any photographs that you would like to be considered for inclusion, please let me know. I can only use good quality photos, at least 200 pixels per inch in digital format or the photo itself. Rest assured, if you send me a photo and a return envelope with postage attached, I will return your original. I need only 10 pictures, or so. So, only send me your best photos. I think a photo plate will enhance the quality of "The Gulf War Chronicles." I look forward to using your contribution. PS please let me know if you have something to send and I will provide you with a mailing address. I have several but this one might be interesting. It is a pic from a main intersection on TAP Line Road. Anyone who served in the Army knows this was the main supply road to get into position for the main assult. I remember that area. I was there for a day or so. I remember that place. 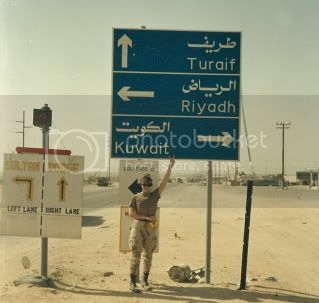 Tapline road, that was the Saudi version of the highway of death.